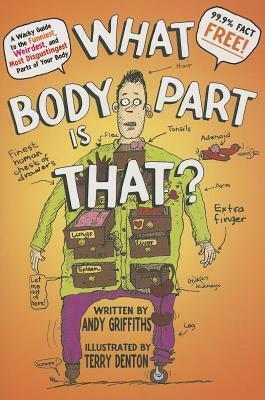 In its 68 fully illustrated, 99.9% fact-free chapters, Andy Griffiths's and Terry Denton's What Body Part Is That? will explain everything you ever needed to know about your body without the boring technical jargon and scientific accuracy that normally clog up the pages of books of this type. Never again will you be stuck for an answer when somebody comes up to you, points at a part of your body and demands to know, "What body part is that?" That is all there is to know about this book. ANDY GRIFFITHS is the New York Times-bestselling author of Killer Koalas From Outer Space, The Big Fat Cow that Goes Kapow, and The Cat on the Mat is Flat. He lives in Australia. TERRY DENTON has worked with Andy on many books, including Killer Koalas From Outer Space and The Big Fat Cow that Goes Kapow. He lives in Australia with his wife and three kids.